The revolutionary scratch removal kit. How many times have you scratched your lenses and spent big bucks on costly lens replacements? Sometimes you just live with the scratches because you can?t afford the replacements. Well, not anymore! 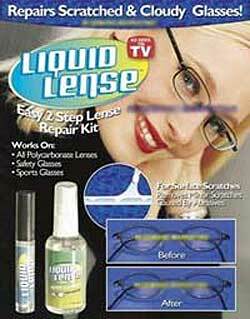 Introducing Liquid Lense, the revolutionary scratch removal kit. You can even scratch the surface of the lens with abrasive steel wool, and Liquid Lense will fill and seal the scratches in the lens making them disappear. The amazing Liquid Lense fill-and-seal technology lets you glide over the lens and fill each scratch with a perfect surface level seal for crystal clear results every time. The before and after is amazing. Even scratches from sandpaper can?t withstand Liquid Lense. The mistake proof formula follows the lens? shape as it fills and seals each scratch, perfectly matching the shape of the lens surface for an invisible repair each and every time. That?s why Liquid Lense is 100% guaranteed to never alter your lens prescription. The secret is in the liquid polymer that allows you to repair each scratch perfectly. 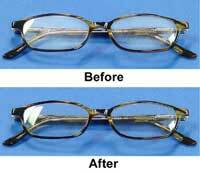 Each time you repair your favorite scratched glasses and sunglasses, you save hundreds of dollars on costly lens replacement. Best of all, you won?t pay hundreds of dollars for the amazing Liquid Lense Scratch Removal Kit. Repairs scratched and cloudy glasses!